A family trip to Portland this past summer, where we became obsessed with Vietnamese noodle houses, ignited our love for PHO (pronounced FUH). This delicious Vietnamese soup is typically made from beef stock and spices to which noodles and beef or chicken are added. 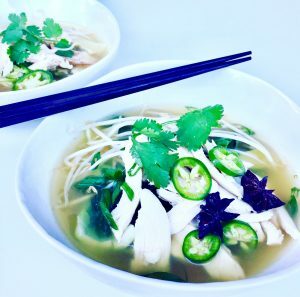 Although we love pho made with beef stock, a concentrated chicken stock makes for a wonderful rendition. Combine stock, ginger and star anise in a saucepan and let simmer until broth is aromatic, for 15 minutes or so. Add the fish sauce, lime and bok choy. Remove from heat when bok choy has wilted. Meanwhile, fill each of 4 soup bowls with chicken, scallions, and jalapeno. Add chicken broth. Garnish with bean sprouts, cilantro and lime wedges.